Western idea of Tibet is somewhere distant and exotic, yet in the markets of Tibet; Yunnam and Szechuan Provinces of China were flooded with Indian Rupee or other foreign coins during the early 20th century, the 四川總督 Governor General of Szechuan Province of China, 錫良 "Hsi Liang" and his assistant 趙爾豐 "Chao I-Feng" ( 永寧道台 Yung Ning Tao T'ai), decided to mint a new type of silver coin which is similar to 爐關 "Lu Kuang" silver coins. 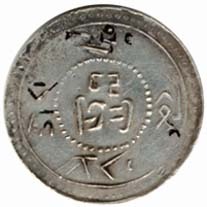 The new coinage was known as 四川盧比 Szechuan Rupee, (also known as Tibet Rupee) it served as a counter-measure to resist the influx of the foreign currency. The coinage of Szechuan Rupee continued to be struck as recently as the 33rd year of the Republic, 1944, but with lowered puresilver content. I am very surpriing that the use of Szechuan Rupee as media of exchange had lasted until 1st April 1958 in some districts (甘孜藏族自治州 Kan Tzu Tibetan Autonomous Region) of Szechuan province. When the Notice of the 關於嚴格管理外國貨物和禁止金銀流通的規定 "Regulation of the Management of Foreign Goods and the Forbidden of Gold and Silver Currency" posted by 甘孜藏族自治州人民委員會 "People's committee of the Kan Tzu Tibetan Autonomous Region" on 1st April 1958, Szechuan Rupee was forbidden using as legal tender again. The use of Szechuan Rupee as media of exchange had lasted for half century. According to the 西藏自治區金銀管理和禁止外幣, 銀行流通暫行辦法 "Tentative Measures Concerning the Management of Gold & Silver and the Ban on Circulation of Foreign Currency in the Tibet Autonomous Region" issued by the People's Government of the Tibet Autonomous Region on 10 May, 1962, the circulation of silver coins on the currency market in China came to an end should be on 10 May, 1962. 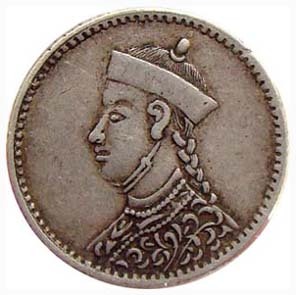 It is believed that in the 28th year of Emperor Kuang Hsu reign of the Qing dynasty, (1902AD) 劉廷恕 "Liu Ting Shu", Sub-Prefect of Ta Chien LU (now K'ang Ting district), who minted 爐關 "Lu Kuang" silver coins in order to boycott the foreign coins in Szechuan Province in 1901. Liu used the silver being transported to Tibet as military expenses to mint the coin. 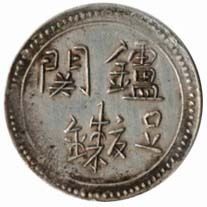 The obverse of this coin bearing five Chinese characters meaning "Sufficient fineness of silver coin minted by Lu Kuang". The reverse of this coin are inscribed with Tibetan words and decorated with some floral patterns. It is pity that I don't know Tibetan scripts. Tibetan used "Lu Kuang" to pay the taxes to the Qing government. 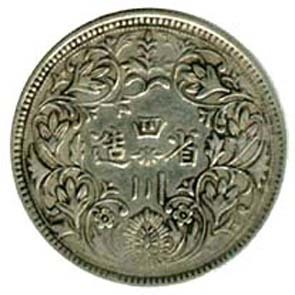 The mintage of "Lu Kuang" was about 200,000 pieces in 1902, and 800,000 pieces in 1903. 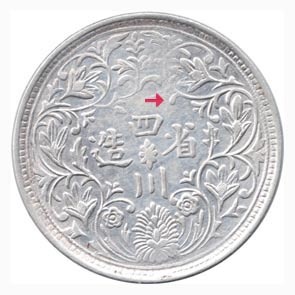 (Information from China Numismatics 1990 No.1 page 47) The "Lu Kuang" silver coin is a extremely rare coin for most of them were melted down for their excessive silver content during the past century. I would like to take this opportunity to say ''Thanks" to Mr. YZM as he is so kind as to let me use his coin images. In 1902, the 28th year of the Reign of Guang Xu of the Qing Dynasty, Liu Tingshu, magistrate of the prefecture of Dajianlu (today's Kangding) obtained permission to mint silver coins with silver being transported the Tibet as military expenses. 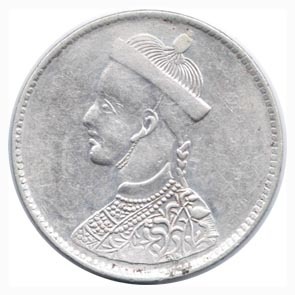 He took the initiative in the face of the influx Indian Rupees into Yunnan and Sichuan via Tibet at that time and proposed to the Qing court to mint China's own ilver coins as a counter-measure to resist the Rupee invasion. The coins bear the two Chinese characters of "Lu Guan" on the obverse and Tibetan words and floral patterns on the reverse.. When I write this page, I find an interesting thing. 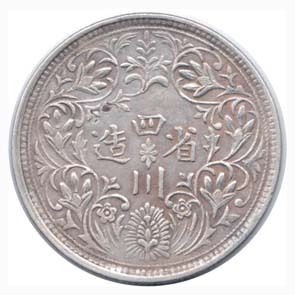 With reference to the Standard Catalog of World Coins, the mintage figure of this Quarter Rupee is 0.823 millions pieces but I find the mintage figure in the Chinese reference is only 110,000 pieces. The profile portraits of Emperor Kuang Hsu appear on the three kinds (in denomination) of Tibet Rupee coin are completely different. . This coin has a lot of detail and no problems, except it has been cleaned. This shiny coin looks in a "newer" condition. But I don't think this is a new coin. 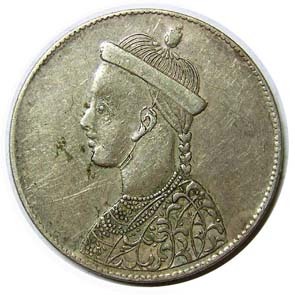 The "luster" of this coin is unreasonable, as this coin was minted almost a century before. A natural coin has a particular appearance which reflects the history of itself. Coin that has lived for a long time tends to have spectacular colored toning. But this coin tends to be extremely uniform in colour, including the tops of the characters and protected areas. I think this coin was retoned by someone. Personally I don't suggest cleaning coins, though this coin is very well cleaned. Actually, even if you scrub or wipe the surface of a coin gently with a cloth, the particles of dirt that are on the coin or the cloth will scratch the coin's surface. Scratches and other abrasions severely detract from the value of a coin. 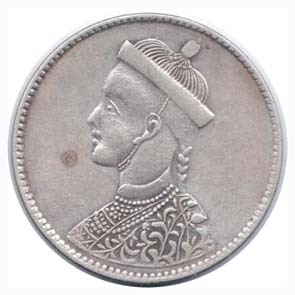 The mintage of this Half Rupee is 0.136 millions pieces in Western reference, and the mintage is 140,000 pieces in the Chinese reference. The figures are very close. 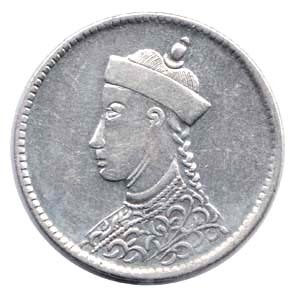 For the Quarter Rupee and Half Rupee coins, The portraits of Emperor Kuang Hsu appeared with collar and all the rosettes on the reverse are located vertically. The obverse of this coin bears a profile of Emperor Kuang Hsu (This is known as the Type 1 Kuang Hsu profile by the Chinese collectors). On the reverse There are 4 Chinese characters meaning "Minted in Szechuan Province" and floral patterns along the border. A vertical rosette is located in the center. (Horizontal rosette in center also existed.) 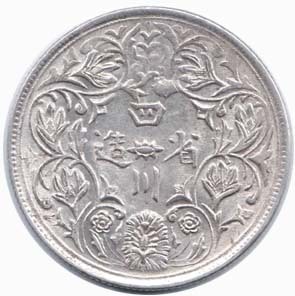 Szechuan Rupee has several editions with about 42 variations in the designs and floral patterns. This coin is belonged to the early minted type with silver content more than 90%. I think this coin was minted between 1905 to 1911. This can be easily judged by the first Chinese character "Szu" shaped with 2 vertical strokes hanging inside the rectange. 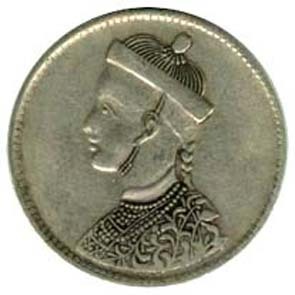 The obverse of this coin bears a portrait of Emperor Kuang Hsu (without collar). This rupee is known as the Type 1 Szechuan rupee coin by the Chinese collectors. 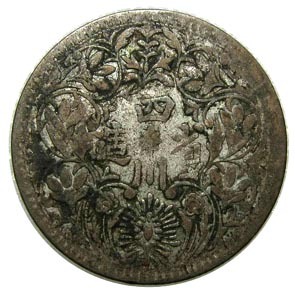 The designs of the floral patterns on the reverse is different from the above coin. A horizontal rosette is located in the center. This coin belongs to the extremely early minted type. I think this coin was minted in 1905. Please be noted that a small rosette has actually touched the Chinease character "Szu" on the reverse. This coin is 4 times more valuable than a common Szechuan Rupee of the same condition in the coin shop, it is because it bears a horizontal rosette on the reverse. 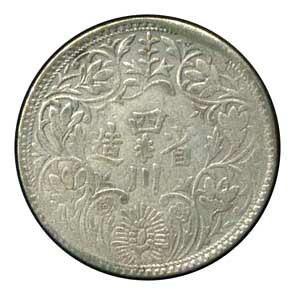 The design of this coin was struck similar to the above coin (No.318), except the portrait of Emperor Kuang Hsu appears with collar just like the most common type of Szechuan Rupee. This coin has used the Type 1 Kuang Hsu profile on the obverse. On the reverse there is a horizontal rosette located in the center. I believe that this coin is one of the rarest edition. Of course, this coin should be the early Szechuan Rupee (This is the type 1 Sichuan Rupee.). Only very few were minted before 1911. 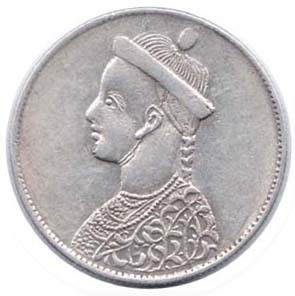 The design of this coin was struck similar to the above coin (The portrait of Emperor Kuang Hsu appears without collar too) except on the reverse there is a vertical rosette located in the center. This coin is rarer than the above coin. Szechuan Rupee was issued in proposing to check the circulation of the Indian Rupee on the market. A Szechuan Rupee is equalled to 3 Tangka coins. By Judging from the first Chinese character "Szu" shaped with 2 vertical strokes hanging inside the rectange on the reverse, I know this coin was minted between 1905 to 1911.I would grade it as a high end VF or maybe a lowend EF. This coin is special for the variety of an additional leaf is found above the Chinese character "Szu" on the obverse. 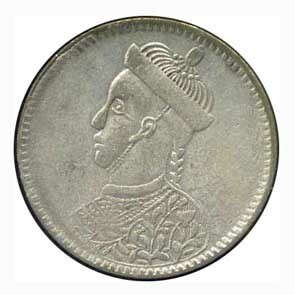 This coin was minted between 1911 and 1916 with silver content about 70%, and it was struck similar to the previous obverse but the neck of the portrait is slightly shorter, and the design of collar is different. This is known as the type 3 Sichuan rupee by the Chinese collectors. On the reverse Szechuan Rupee always have different editions floral pattern design. For this coin, the first Chinese character "Szu" shaped with 2 opposit strokes in a slanting position pointed to each other inside the rectange showing that this coin was minted later than the previous one. 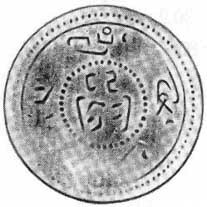 This is a type 3 Sichuan Rupee coin. 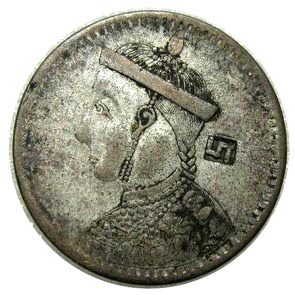 By Judging the surface colour on the obverse of this coin, we easily know that the silver content of this coin is very low. I think its finess is about 30% only. 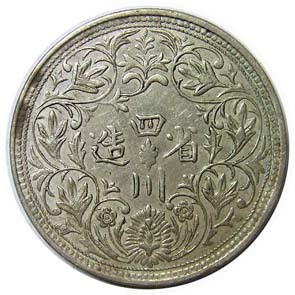 This coin was one of those minted for using in "K'ang Ting" district between 1930 to 1939. As I know that the finess of the later minted Szechuan Rupee, is low scarce in even 10% silver content. They always appeared in a reddish colour. That is why they are known as 紅藏洋 "Red T'sang Yang". This is a type 4 Sichuan rupee. You can find that there is a countermark appeared near the queue of the emperor's portrait. It is believed that some of the Red T'sang Yang appeared with countermarks. These countermarks were struck by the lamas of Litang Monastery in order to upgrade their value. But the countermarks appears on the face of Emperor Kuang Hsu's profile are rare. 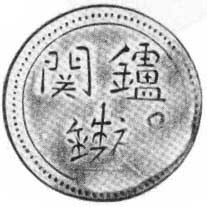 In 1931, Kansu Mint had imitated 100,000 pieces of Szechuan Rupee with silver content less than 50%, by the request of 馬麟 "Ma Lin", Chairman of Tsinghai Provincial government. All Kansu Rupee coins appeared in reddish colour. Later people refused to use that type of coins, Kansu Mint ceased to mint soon. I give below is a rough estimate of the mintage of Szechuan Rupee. From the table, we know that the total mintage of Szechuan Rupee are about $25,500,000 to $27,500,000 from 1905 to 1943. According to the estimation of some Chinese scholars, there are about $3,500,000 Szechuan Rupee still in circulation in the market during 1952, and the amount reduced to $2,000,000 in 1958. Chinese Government withdrew about $1,000,000 Szechuan Rupee in 1958. 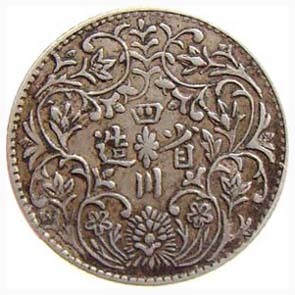 During the circulation for half century, many Szechuan Rupee had continuously been collected or melted down for its silver content. Some of the coins (especially those in lower denominations) were kept as ornament by the ladies of Tibetan or other nomads. The surviving of Szechuan Rupee became rare today. On the other hand, Szechuan Rupee were cut into 2 or 4 pieces, served as Half Rupee and Quarter Rupee during 1911, due to the insufficient supply of the low denomination coins. 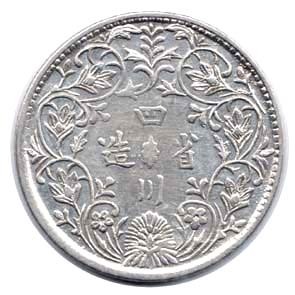 Cutting coins were colloquially called 'cho-tang' by the Tibetans or called 宰口藏洋 "Tsai-K'ou T'sang-Yang" by the Han.